Have you heard of the term “pillar page” yet? If you work in the content marketing world, you most likely have. If you haven’t, it’s time to familiarize yourself. Content marketers have fairly recently started adopting the topic cluster website organization strategy, and they are beginning to be more proactive about implementing it on websites. Pillar pages, if developed and treated the right way, can help you build greater authority for your website. This strategy will help you reorganize your site so its navigation makes a lot more sense to search engines and human visitors. In this comprehensive guide, I’ll explain how you can effectively create a pillar page from start to finish, from developing a topic to publishing the new page on your website. You’re an expert in your industry and you have a lot to offer the world; PROVE IT with pillar pages. Read straight through, or jump to the section you want to read! What Are Topic Clusters and Subtopics? Neil Patel defines a pillar page as a “topical cornerstone for a large portion of your site’s content.” HubSpot says a pillar page “acts as the main hub of content for an overarching topic.” A pillar page should be based on one of the core topics on your website—something you’re trying to rank highly for on search engines. Your main objective is to provide real value to your target audience so they come to you for expert advice and information. "The key is to start thinking in terms of TOPICS you want to own, not just KEYWORDS. This allows you to own a 'sphere of influence' on the internet." A topic cluster is composed of one pillar page (a core topic) that links to several other pages (subtopics) on a website. The core topic and all of its subtopics should be closely related to each other. You should cover your core topic in depth on your pillar page and touch on each subtopic. The subtopic sections on the page will then link out to the other pages on your website that explain the specific subject even more in depth. The topic cluster model makes it easier for search engines to scan semantic content on your website and see how deeply you understand a particular topic. Having more breadth and depth on a topic on your site will give you more authority for that topic on the web. The goal is to make your website as useful as possible for searchers in order to earn higher placement on SERPs (search engine results pages). 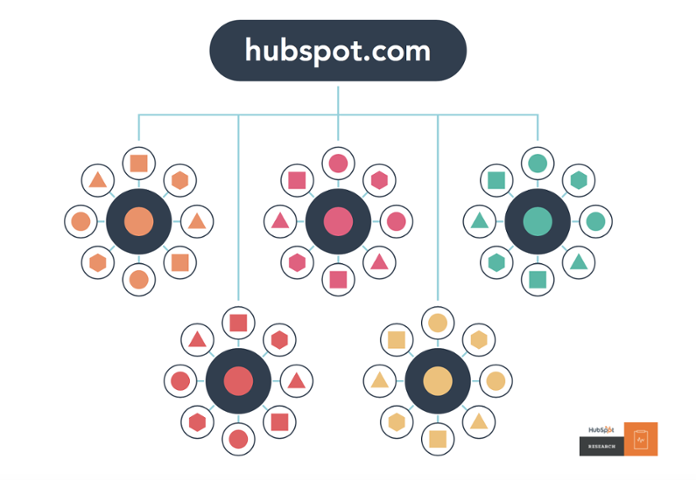 HubSpot’s topic cluster diagram provides a visual representation of how our websites can be mapped out using this content strategy. Each of the large central circles represents a pillar page, while the outer circles represent subtopic pages. The blue lines connecting them are hyperlinks. 1. Choose a core topic. The first step in building your pillar page is choosing a core topic. It should be specific to your industry and support one of your products or services in the awareness (educational) stage of the buyer’s journey. It should also be evergreen and broad—but not overly broad. Choose a topic that can be broken down into several supporting subtopics. “If you’re trying to get the page you’re working on to rank for a long-tail keyword, it’s not a pillar page. If the page you’re working on explores a very narrow topic in great depth, it’s not a pillar page. Do some research to determine your business’s specific buyer personas. This is a very important step in the process; don’t overlook it. Think about your customers’ biggest challenges or pain points. What information do they often look for on your website to find solutions to their problems? Getting to the heart of these problems and offering educational information on your website will help you create a highly effective pillar page. You should also do some research to see what your competitors and the leaders in your industry are ranking highly for. Buzzsumo is a great resource for this. Many of our customers come to us wanting to grow their online presence through blogging and other forms of content. We could, therefore, choose content marketing as one of our pillar page topics. It’s specific to our industry and one of the main services we offer. It’s broad enough that we have the opportunity to really dig in and explain the topic in depth on our website and link to many other valuable internal resources. At the same time, it’s narrow enough that we won’t have to cover so much that it becomes invaluable or overwhelming for the reader (and confusing for search engines). Typically, shoot for making your pillar topics 2–3 words. Creating a pillar page on just “content” or “marketing” would be far too difficult—or impossible—to cover comprehensibly. On the other hand, “top content marketing tools” could potentially be too narrow and might make a better subtopic. The next step is to develop a list of subtopics so you can create your cluster. Start by doing some keyword research. Also find out what terms and questions are being entered into Google that fall under your main topic umbrella. Enter your core topic into Google, and see what comes up! Don't forget to look near the bottom of the SERP at the related searches as well. Another good resource for researching keywords is Keyword Tool at keywordtool.io. The free version gives you a list of keywords with the highest search volume that contain the keyword you entered; the paid version shows you the actual search volume data, the cost per click, and the AdWords competition for each keyword suggestion. Think about what strong content you already have that falls into your subtopic categories, and begin compiling a list of links to include when you build your page. If there are any subtopics you haven’t written about yet, you’ll need to develop new pieces to fill those gaps later and update your pillar page once that’s done. 3. Write, organize, and edit your pillar page content. It’s time to begin the writing process. In general, a pillar page will be much longer than a typical blog post. It will likely be closer to the length of an ebook. Organize your content in a way that makes it easy for your readers to follow and find the information they’re looking for quickly, while keeping your conversion goals in mind at the same time. Start with an introduction in which you define your pillar page topic and give an overview of what visitors will find on the page. Next, dive into writing about each of your subtopics. Focus on answering questions and writing for the user. Be of as much help to someone researching your topic as you possibly can, using links to other pages on your website to help. 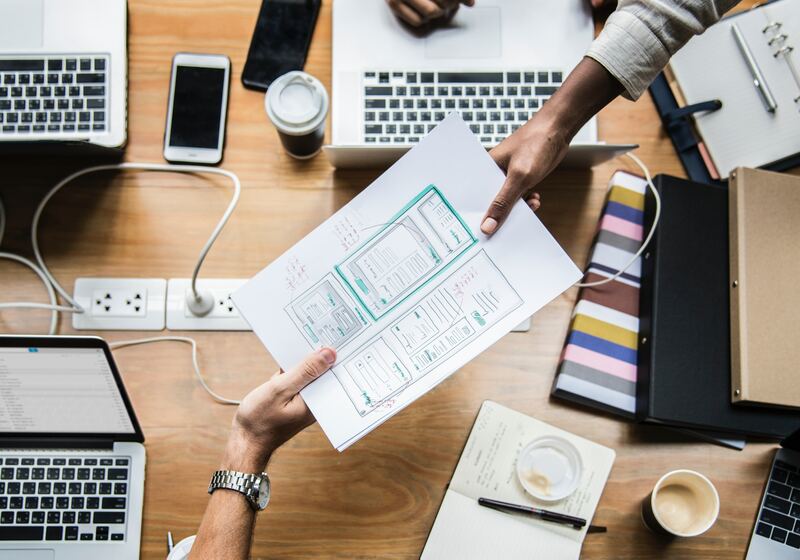 Your subtopic sections should provide great value to the reader and then link to other pieces of content on your website that provide even more detail and help take readers through the buyer’s journey. HubSpot advises us to use 20–30 internal links on a page to keep it focused. (Each of these content pieces should also refer and link back to the pillar page to create hyperlinks that go both ways.) You should also link to some external sources throughout your page, such as to industry leaders, case studies, and research, for added credibility. Write everything out, and revise and edit it until it’s as good as it can get. Try to make this "10x content" (ten times better than anything else so it stands out), conversion focused, and educational for anyone who finds it. You want people to get excited when they find your page so they revisit it and share it with others! 4. Build your pillar page. Next, it’s time to design your pillar page and optimize the content on your website. First of all, you want this page to be ungated; users shouldn’t have to fill out a form to access it. You also want Google to be able to crawl it easily. If you’d like to give users the option to download the information in PDF form so they can save it to read later, consider giving them that option on this page as well. Include a simple form that allows them to download it quickly and easily in exchange for a bit of contact information (such as name and email). Saves users from having to scroll! You still want this page to be conversion focused, so don’t forget to include a form somewhere so users can contact you for help. If it looks out of place or interrupts your page flow, it may be better to leave it out. 5. Share, promote, and show off your new page! 6. Update your page as needed. Once you get to this step, give yourself a pat on the back. You’ve done a lot of work and should be proud of it, but don’t just set it and forget it! Your pillar page should be under constant surveillance. As you learn more and build more closely related content on your website, you’ll need to adjust this page accordingly. Keep it fresh and up to date so it remains useful. Also begin watching the traffic to your page to see how it’s performing so you can make necessary adjustments over time. HubSpot has a strategy tool that makes it easy to track the performance of your topic clusters. If you plan it right, this could take you a long way and save you a lot of time on content creation in the future. There you have it—a guide to help you get started with your pillar page content strategy. What do you think? Will this strategy help you gain more qualified leads? If you’ve already started creating pillar content on your website, what kinds of results have you seen so far? We’d love to hear from you. Comment below! If you need help with your content marketing or developing a stronger SEO strategy, Blue Frog is here to help. Contact us anytime. We have offices in Denver, Huron, and Des Moines and work with clients across the US. Schedule a free consultation with us to get started!